This article is about the 2001 antitrust lawsuit. For other cases with similar names, see United States v. Microsoft Corp. (disambiguation). United States v. Microsoft Corporation, 253 F.3d 34 (D.C. Cir. 2001), is a U.S. antitrust law case, settled by the Department of Justice (DOJ), in which the technology company Microsoft was accused of holding a monopoly and engaging in anti-competitive practices contrary to sections 1 and 2 of the Sherman Antitrust Act. United States v. Microsoft Corp., 87 F. Supp. 2d 30 (D.D.C. 2000); 97 F. Supp. 2d 59 (D.D.C. 2000), direct appeal denied, pet. cert. denied, 530 U.S. 1301 (2000). That the finding of the District Court that Microsoft violated the Antitrust Act is confirmed, the order of that court is reversed, and remanded for the drafting of a subsequent order. Harry T. Edwards, CJ; Stephen F. Williams, Douglas H. Ginsburg, David B. Sentelle, A. Raymond Randolph, Judith W. Rogers, and David S. Tatel, JJ. The plaintiffs alleged that Microsoft had abused monopoly power on Intel-based personal computers in its handling of operating system and web browser integration. The issue central to the case was whether Microsoft was allowed to bundle its flagship Internet Explorer (IE) web browser software with its Windows operating system. Bundling them is alleged to have been responsible for Microsoft's victory in the browser wars as every Windows user had a copy of IE. It was further alleged that this restricted the market for competing web browsers (such as Netscape Navigator or Opera), since it typically took a while to download or purchase such software at a store. Underlying these disputes were questions over whether Microsoft had manipulated its application programming interfaces to favor IE over third-party web browsers, Microsoft's conduct in forming restrictive licensing agreements with original equipment manufacturers (OEMs), and Microsoft's intent in its course of conduct. Microsoft stated that the merging of Windows and IE was the result of innovation and competition, that the two were now the same product and inextricably linked, and that consumers were receiving the benefits of IE free. Opponents countered that IE was still a separate product which did not need to be tied to Windows, since a separate version of IE was available for Mac OS. They also asserted that IE was not really free because its development and marketing costs may have inflated the price of Windows. The case was tried before Judge Thomas Penfield Jackson in the United States District Court for the District of Columbia. The DOJ was initially represented by David Boies. Compared to the European Decision against Microsoft, the DOJ case is focused less on interoperability and more on predatory strategies and market barriers to entry. is widely recognized as the most influential company in the microcomputer-software industry. Claiming more than a million installed MS-DOS machines, founder and chairman Bill Gates has decided to certify Microsoft's jump on the rest of the industry by dominating applications, operating systems, peripherals and, most recently, book publishing. Some insiders say Microsoft is attempting to be the IBM of the software industry. Although Gates says that he isn't trying to dominate the industry with sheer numbers, his strategy for dominance involves Microsoft's new Windows operating system ... "Our strategies and energies as a company are totally committed to Windows, in the same way that we're committed to operating-system kernels like MS-DOS and Xenix," says Gates. "We're also saying that only applications that take advantage of Windows will be competitive in the long run." Gates claimed that Microsoft's entrance into the application market with such products as Multiplan, Word and the new Chart product was not a big-time operation. The U.S. government's interest in Microsoft began in 1992 with an inquiry by the Federal Trade Commission over whether Microsoft was abusing its monopoly on the PC operating system market. The commissioners deadlocked with a 2–2 vote in 1993 and closed the investigation, but the Department of Justice led by Janet Reno opened its own investigation on August 21 of that year, resulting in a settlement on July 15, 1994 in which Microsoft consented not to tie other Microsoft products to the sale of Windows but remained free to integrate additional features into the operating system. In the years that followed, Microsoft insisted that Internet Explorer (which, in addition to OEM versions of Windows 95, appeared in the Plus! Pack sold separately) was not a product but a feature which it was allowed to add to Windows, although the DOJ did not agree with this definition. Lawsuits brought by the U.S. Department of Justice, 18 states, and the District of Columbia in two separate actions were resolved through a Consent Decree that took effect in 2001 and a Final Judgment entered in 2002. These proceedings imposed various constraints on our Windows operating system businesses. These constraints include limits on certain contracting practices, mandated disclosure of certain software program interfaces and protocols, and rights for computer manufacturers to limit the visibility of certain Windows features in new PCs. We believe we are in full compliance with these rules. However, if we fail to comply with them, additional restrictions could be imposed on us that would adversely affect our business. Bill Gates during his deposition. The suit began on May 18, 1998, with the U.S. Department of Justice and the Attorneys General of twenty U.S. states (and the District of Columbia) suing Microsoft for illegally thwarting competition in order to protect and extend its software monopoly. In October 1998, the U.S. Department of Justice also sued Microsoft for violating a 1994 consent decree by forcing computer makers to include its Internet browser as a part of the installation of Windows software. While the DOJ was represented by David Boies, the States were separately represented by New York Attorneys General Alan Kusinitz, Gail Cleary and Steve Houck. Bill Gates was called "evasive and nonresponsive" by a source present at his deposition. He argued over the definitions of words such as "compete", "concerned", "ask", and "we". Businessweek reported that "early rounds of his deposition show him offering obfuscatory answers and saying 'I don't recall' so many times that even the presiding judge had to chuckle. Many of the technology chief's denials and pleas of ignorance have been directly refuted by prosecutors with snippets of email Gates both sent and received." Intel Vice-President Steven McGeady, called as a witness, quoted Paul Maritz, a senior Microsoft vice president, as having stated an intention to "extinguish" and "smother" rival Netscape Communications Corporation and to "cut off Netscape's air supply" by giving away a clone of Netscape's flagship product for free. A number of videotapes were submitted as evidence by Microsoft during the trial, including one that demonstrated that removing Internet Explorer from Microsoft Windows caused slowdowns and malfunctions in Windows. In the videotaped demonstration of what then-Microsoft vice president Jim Allchin stated to be a seamless segment filmed on one PC, the plaintiff noticed that some icons mysteriously disappear and reappear on the PC's desktop, suggesting that the effects might have been falsified. Allchin admitted that the blame for the tape problems lay with some of his staff. "They ended up filming it—grabbing the wrong screen shot", he said of the incident. Later, Allchin re-ran the demonstration and provided a new videotape, but in so doing Microsoft dropped the claim that Windows is slowed down when Internet Explorer is removed. Mark Murray, a Microsoft spokesperson, berated the government attorneys for "nitpicking on issues like video production". Microsoft submitted a second inaccurate videotape into evidence later the same month as the first. The issue in question was how easy or hard it was for America Online users to download and install Netscape Navigator onto a Windows PC. Microsoft's videotape showed the process as being quick and easy, resulting in the Netscape icon appearing on the user's desktop. The government produced its own videotape of the same process, revealing that Microsoft's videotape had conveniently removed a long and complex part of the procedure and that the Netscape icon was not placed on the desktop, requiring a user to search for it. Brad Chase, a Microsoft vice president, verified the government's tape and conceded that Microsoft's own tape was falsified. When the judge ordered Microsoft to offer a version of Windows which did not include Internet Explorer, Microsoft responded that the company would offer manufacturers a choice: one version of Windows that was obsolete, or another that did not work properly. The judge asked, "It seemed absolutely clear to you that I entered an order that required that you distribute a product that would not work?" David Cole, a Microsoft vice president, replied, "In plain English, yes. We followed that order. It wasn't my place to consider the consequences of that." Microsoft vigorously defended itself in the public arena, arguing that its attempts to "innovate" were under attack by rival companies jealous of its success, and that government litigation was merely their pawn (see public choice theory). A full-page ad run in The Washington Post and The New York Times on June 2, 1999, by The Independent Institute delivered "An Open Letter to President Clinton From 240 Economists On Antitrust Protectionism." It said, in part, "Consumers did not ask for these antitrust actions – rival business firms did. Consumers of high technology have enjoyed falling prices, expanding outputs, and a breathtaking array of new products and innovations. ... Increasingly, however, some firms have sought to handicap their rivals by turning to government for protection. Many of these cases are based on speculation about some vaguely specified consumer harm in some unspecified future, and many of the proposed interventions will weaken successful U.S. firms and impede their competitiveness abroad." Judge Thomas Penfield Jackson issued his findings of fact on November 5, 1999, which stated that Microsoft's dominance of the x86-based personal computer operating systems market constituted a monopoly, and that Microsoft had taken actions to crush threats to that monopoly, including Apple, Java, Netscape, Lotus Software, RealNetworks, Linux, and others. Judgment was split in two parts. On April 3, 2000, he issued his conclusions of law, according to which Microsoft had committed monopolization, attempted monopolization, and tying in violation of Sections 1 and 2 of the Sherman Antitrust Act. Microsoft immediately appealed the decision. On June 7, 2000, the court ordered a breakup of Microsoft as its "remedy". According to that judgment, Microsoft would have to be broken into two separate units, one to produce the operating system, and one to produce other software components. The trial was also notable for the use by both the prosecution and the defense of professors of MIT to serve as expert witnesses to bolster their cases. Richard L. Schmalensee, a noted economist and the dean of the MIT Sloan School of Management, testified as an expert witness in favor of Microsoft. Franklin Fisher, another MIT economist who was Schmalensee's former doctoral thesis adviser, testified in favor of the Department of Justice. After a notice of appeal was filed in the intermediate appellate court, the D.C. Circuit Court of Appeals, the district (trial) court certified appeal directly to the U.S. Supreme Court under 15 U.S.C. §29(b), which gives the Supreme Court jurisdiction to hear direct appeals from the district court in certain antitrust cases initiated by the federal government if "the district judge who adjudicated the case enters an order stating that immediate consideration of the appeal by the Supreme Court is of general public importance in the administration of justice." The states also filed a petition for certiorari before judgment in the Supreme Court, which requested that the Supreme Court hear their appeals from the district court's decision without proceeding first through the district court of appeals. However, the Supreme Court declined to hear the federal government's appeal, remanding the case to the district court of appeals, and also denied the states' petition for certiorari before judgment. The D.C. Circuit Court of Appeals overturned Judge Jackson's rulings against Microsoft. This was partly because the appellate court had adopted a "drastically altered scope of liability" under which the remedies could be taken, and also partly due to the embargoed interviews Judge Jackson had given to the news media while he was still hearing the case, in violation of the Code of Conduct for US Judges. Judge Jackson did not attend the D.C. Circuit Court of Appeals hearing, in which the appeals court judges accused him of unethical conduct and determined he should have recused himself from the case. Judge Jackson's response to this was that Microsoft's conduct itself was the cause of any "perceived bias"; Microsoft executives had, according to him, "proved, time and time again, to be inaccurate, misleading, evasive, and transparently false. ... Microsoft is a company with an institutional disdain for both the truth and for rules of law that lesser entities must respect. It is also a company whose senior management is not averse to offering specious testimony to support spurious defenses to claims of its wrongdoing." However, the appeals court did not overturn the findings of fact. Although the D.C. Circuit found that it was possible to examine high-tech industries with traditional antitrust analysis, the court announced a new and permissive liability rule that repudiated the Supreme Court’s dominant rule of per se illegality for tie-ins, due to the court’s concern for the dynamic effects that a per se rule would have on innovation. The D.C. Circuit remanded the case for consideration of a proper remedy under a more limited scope of liability. Judge Colleen Kollar-Kotelly was chosen to hear the case. The DOJ announced on September 6, 2001 that it was no longer seeking to break up Microsoft and would instead seek a lesser antitrust penalty. Microsoft decided to draft a settlement proposal allowing PC manufacturers to adopt non-Microsoft software. On November 2, 2001, the DOJ reached an agreement with Microsoft to settle the case. The proposed settlement required Microsoft to share its application programming interfaces with third-party companies and appoint a panel of three people who would have full access to Microsoft's systems, records, and source code for five years in order to ensure compliance. However, the DOJ did not require Microsoft to change any of its code nor prevent Microsoft from tying other software with Windows in the future. On August 5, 2002, Microsoft announced that it would make some concessions towards the proposed final settlement ahead of the judge's verdict. On November 1, 2002, Judge Kollar-Kotelly released a judgment accepting most of the proposed DOJ settlement. Nine states (California, Connecticut, Iowa, Florida, Kansas, Minnesota, Utah, Virginia and Massachusetts) and the District of Columbia (which had been pursuing the case together with the DOJ) did not agree with the settlement, arguing that it did not go far enough to curb Microsoft's anti-competitive business practices. On June 30, 2004, the U.S. appeals court unanimously approved the settlement with the Justice Department, rejecting objections that the sanctions were inadequate. The dissenting states regarded the settlement as merely a slap on the wrist. Industry pundit Robert X. Cringely believed a breakup was not possible, and that "now the only way Microsoft can die is by suicide." Andrew Chin, an antitrust law professor at the University of North Carolina at Chapel Hill who assisted Judge Jackson in drafting the findings of fact, wrote that the settlement gave Microsoft "a special antitrust immunity to license Windows and other 'platform software' under contractual terms that destroy freedom of competition." Law professor Eben Moglen noted that the way Microsoft was required to disclose its APIs and protocols was useful only for “interoperating with a Windows Operating System Product”, not for implementing support of those APIs and protocols in any competing operating system. Microsoft's obligations under the settlement, as originally drafted, expired on November 12, 2007. However, Microsoft later "agreed to consent to a two-year extension of part of the Final Judgments" dealing with communications protocol licensing, and that if the plaintiffs later wished to extend those aspects of the settlement even as far as 2012, it would not object. The plaintiffs made clear that the extension was intended to serve only to give the relevant part of the settlement "the opportunity to succeed for the period of time it was intended to cover", rather than being due to any "pattern of willful and systematic violations". The court has yet to approve the change in terms as of May 2006[update] [needs update]. Economist Milton Friedman believed that the antitrust case against Microsoft set a dangerous precedent that foreshadowed increasing government regulation of what was formerly an industry that was relatively free of government intrusion and that future technological progress in the industry will be impeded as a result. In the January 2007 edition of the Journal of Business & Economic Research, Jenkins and Bing argue that, contrary to Friedman's concerns, the settlement actually had little effect on Microsoft's behavior. The fines, restrictions, and monitoring imposed were not enough to prevent it from "abusing its monopolistic power and too little to prevent it from dominating the software and operating system industry." They conclude that, remaining dominant and monopolistic after the trial, it had continued to stifle competitors and innovative technology. Jean-Louis Gassée, CEO of Be Inc., claimed Microsoft was not really making any money from Internet Explorer, and its incorporation with the operating system was due to consumer expectation to have a browser packaged with the operating system. For example, BeOS comes packaged with its web browser, NetPositive. Instead, he argued, Microsoft's true anticompetitive clout was in the rebates it offered to OEMs preventing other operating systems from getting a foothold in the market. ^ United States v. Microsoft Corp. , 253 F.3d 34 (D.C. Cir. 2001). ^ "The Microsoft case by the numbers: comparison between U.S. and E.U." Le Concurrentialiste. Retrieved February 6, 2015. ^ Caruso, Denise (1984-04-02). "Company Strategies Boomerang". InfoWorld. pp. 80–83. Retrieved 10 February 2015. ^ "Download Web Browser - Internet Explorer". windows.microsoft.com. Microsoft. Retrieved February 6, 2015. ^ a b United States v. Microsoft Corp. , 98-CV-1232, 98-CV-1233 (D.D.C. Nov. 5, 1999). 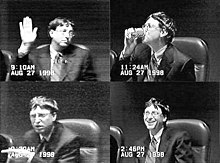 ^ "Gates deposition makes judge laugh in court". CNN. November 16, 1998. Archived from the original on September 2, 1999. Retrieved May 27, 2010. ^ Neuborne, Ellen (November 30, 1998). "Microsoft's Teflon Bill". Businessweek. Retrieved March 19, 2013. ^ Chandrasekaran, Rajiv (November 13, 1998). "Microsoft Attacks Credibility of Intel Exec". The Washington Post. p. B1. Archived from the original on February 25, 2011. Retrieved May 27, 2010. ^ "Buggy Video and More, Microsoft Is Going Backward". Business Week. February 3, 1999. Retrieved December 12, 2014. ^ "Retracing the Missteps in Microsoft's Defense at Its Antitrust Trial". Archived from the original on May 3, 2001. Retrieved November 19, 2018. ^ United States v. Microsoft Corp. , 87 F. Supp. 2d 30 (D.D.C. 2000). ^ a b "U.S. v. Microsoft: Timeline". Wired. Condé Nast. November 4, 2002. ^ United States v. Microsoft Corp. , 97 F. Supp. 2d 59 (D.D.C. 2000). ^ Ingram, Mike (June 9, 2000). "U.S. Judge Orders Break-up of Microsoft". World Socialist Web Site. International Committee of the Fourth International. ^ Lohr, Steve; Joel Brinkley (January 6, 1999). "Pricing at Issue As U.S. Finishes Microsoft Case". The New York Times. Archived from the original on February 25, 2011. Retrieved November 17, 2008. ^ Russell, Kevin. "Overview of Supreme Court's cert. before judgment practice". SCOTUSblog. Retrieved 15 June 2018. ^ "Microsoft Judge Ripped in Court". Wired. February 28, 2001. ^ J. Gregory Sidak & David J. Teece, Dynamic Competition in Antitrust Law, 5 J. Competition L. & Econ. 581, 621–22 (2009). ^ Wilke, John R. (September 10, 2001). "Microsoft Drafts Settlement Proposal, Hoping to Resolve Antitrust Lawsuit". The Wall Street Journal. Archived from the original on September 19, 2001. ^ United States v. Microsoft Corp. , 98-CV-1232 (D.D.C. Nov. 12, 2002). ^ United States v. Microsoft Corp. , 231 F. Supp. 2d 144 (D.D.C. 2002). ^ Eben Moglen (January 28, 2002). "Free Software Matters: Shaking Up The Microsoft Settlement" (PDF). Retrieved February 7, 2013. ^ Friedman, Milton (March–April 1999). "The Business Community's Suicidal Impulse". Policy Forum. Cato Institute. Retrieved February 23, 2013. ^ Gregory T. Jenkins & Robert W. Bing, Microsoft’s Monopoly: Anti-Competitive Behavior, Predatory Tactics, And The Failure Of Governmental Will, 5 J. Bus. & Econ. Research 222 (2007). Abramson, Bruce (2005). Digital Phoenix; Why the Information Economy Collapsed and How it Will Rise Again. MIT Press. ISBN 978-0-262-51196-4. Gavil, Andrew I.; First, Harry (2014-12-09). The Microsoft Antitrust Cases - Competition Policy for the Twenty-first Century. Cambridge, Massachusetts, USA: MIT Press. ISBN 978-0-262-02776-2. Liebowitz, S. J.; Margolis, Stephen (March 1, 2001). Winners, losers & Microsoft: competition and antitrust in high technology. Independent Institute. ISBN 978-0-945999-84-3. Archived from the original on March 20, 2015. Retrieved November 29, 2010. Page, William H.; Lopatka, John E. (2009). The Microsoft Case: Antitrust, High Technology, and Consumer Welfare. University of Chicago Press. ISBN 978-0-226-64464-6. Reynolds, Alan (2001). The Microsoft Antitrust Appeal. Hudson Institute. Final Judgment in U.S. v. Microsoft (injunction including final settlement terms approved by the court) (note that the copy posted on the district court's web site is actually an earlier version that the court declined to approve).